Increase your paint mixing efficiency while reducing your total cost of ownership: Benefit from the precise, reliable and fast results of the new PMA.Evolution. Its superior readability - both from an angle and from a distance - make it a practical and time-saving tool to work with. With a variety of accessories you can enhance the functionality and usability of this high-quality Made-in-Germany product..
Increase your paint-mixing efficiency while reducing your total cost of ownership: Benefit from the precise, reliable and fast weighing results of the new Sartorius PMA.Evolution. 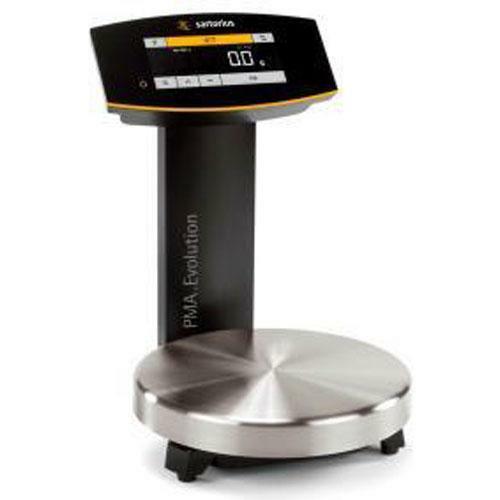 The PMA.Evolution paint-mixing scales feature a truly innovative design. They make your daily work easy with their display surface made of tempered glass that is so simple to wipe clean. These scales enable you to experience evolution at its best. Their next-generation user interface with a rich-in-contrast display and sensor touch technology are designed for convenient operation – you’ll almost forget you’re working. high-contrast “white on black” backlit display is easy to see – even from odd angles and at a distance. Additional features, such as PMA.Management software, a variety of built-in apps and the integrated mix module, let you define your multi-step workflows to maximize efficiency – and your comfort zone. Enjoy paint scales with build quality that’s “Made in Germany.” PMA.Evolution is amazingly fast to install. Thanks to its new installation concept, one cable is all you need to power the scale and transfer data. The PMA.Evolution.series covers scales for use in hazardous areas and those verifiable as legal for trade. 30 ft. 60 ft. 100 ft.